Impeccable words of Olowo (E 'Pluribus Unum). I took a nap this morning after the rain that cooled the atmosphere, on waking I realized I've got alot of chat messages waiting my response, amongst them was Olowo's message... It's below. "I no wan talk too much but I gat to say something. 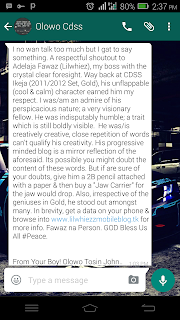 A respectful shoutout to Adelaja Fawaz (Lilwhiezz), my boss with the crystal clear foresight. Way back at CDSS Ikeja (2011/2012 Set, Gold), his unflappable (cool & calm) character earned him my respect. I was/am an admire of his perspicacious nature; a very visionary fellow. He was indisputably humble; a trait which is still boldly visible. He was/is creatively creative, close repetition of words can't qualify his creativity. His progressive minded blog is a mirror reflection of the aforesaid. Its possible you might doubt the content of these words. But if are sure of your doubts, give him a 2B pencil attached with a paper & then buy a "Jaw Carrier" for the jaw would drop. Also, irrespective of the geniuses in Gold, he stood out amongst many. In brevity, get a data on your phone & browse into www.lilwhiezzmobileblog.tk for more info. Fawaz na Person. GOD Bless Us All #Peace. From Your Boy! Olowo Tosin John...."
Seriously he got me, I was blank for a moment and didn't have an idea what to do... Olowo I just want to say thank you, and I largely appreciate this.